At long last we are back on the road. Although it feels fabulous, the ride out of Quito reminded us that bike touring is not all fun and games... Heavy traffic, steep, long climbs, honking trucks and clouds of exhaust were a bit of a sensory overload for the first couple of days, but we have now turned off the busy Pan-American highway and are enjoying some idyllic small roads! We arrived at the Quito airport at about midnight. Unfortunately our bikes did not. They got stuck in Atlanta, apparently because there was too much excess luggage. The agent assured us that they would arrive the next night and would be brought to us in Quito. This was actually a blessing in disguise, as it would have been a pretty big hassle and fairly expensive to find a taxi big enough to handle our two huge bicycle boxes. So we arrived at our old hotel at just after one in the morning, and amazingly we were given the exact same room. It was a strange feeling to be back in the same space, almost as if we had only been away a week or two. The bikes arrived two days later and although the boxes looked like some large animals had taken bites out of them, our bikes and gear were more or less intact. We spent our three days in Quito visiting some of the museums that I had not had a chance to go to, watching an extremely avant-garde dance performance, and sampling all the vegetarian restaurants that Glenn had scoped out back in March. On Sunday June 9, the time had finally come to hit the road again! We got up early, got organized and headed out of the city with hundreds, possibly thousands of other cyclists on the incredible ciclopaseo. Every Sunday, the city of Quito closes off approximately 50 km of road to motorized traffic and the streets fill with cyclists! We experienced this way back in Guadalajara, Mexico as well... and it is pretty heart-warming to see the commitment and organization that these cities have put into promoting cycling. So the first 15 km or so of our ride out of the city was a joy...and then the ciclopaseo ended and we were back with the motorized vehicles and all of the associated noises and smells. We wove our way through city streets before reaching the eightlane highway! Luckily there was a generous shoulder to put us somewhat at ease, but it was not the most ideal cycling situation. Early afternoon we made it to the town of Machachi, where there is a fire station that is known for taking in cyclists. When we arrived at the station, we were welcomed in and offered a room (in the gym!) before we even had a chance to ask! We had a relaxing afternoon reading, getting some groceries, and wandering through the animal market that was closing. We discovered you can buy a bunny for $2.00 .... Though don't think they are intended as pets. That evening we went to bed pretty early, tired from a lot of climbing and a head-windy sort of day. We headed off early again, and it was good that we did. We hadn't done any research with regards to the elevation profile of this ride. We found ourselves climbing all morning, against a fierce head-wind. We had started our day at 2900 meters.... So we knew that we were climbing pretty high. Finally after hours of wind and sweat we reached the top, it was mighty cold but we had a stunning view of the volcano Cotopaxi , albeit a little obstructed by clouds. The rest of the afternoon was much more amiable as we cruised back down to 2900 meters and the town of Latacunga. We found out that evening that we had climbed up to 3500 meters ... Our highest elevation yet! Latacunga is a very nice little town, it appears to be the jumping off point for those doing treks up to Cotopaxi... Perhaps becuase of this it was a little difficult finding a cheap room in town...but eventually we lucked out with a big comfortable room and we had a relaxing evening again! 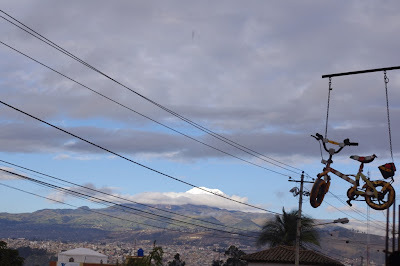 We left town a little later than normal anticipating an easy ride to Ambato where a fellow named Leonardo has a bike shop and takes in touring cyclists. Sometimes anticipating a short day is a mistake, but luckily it was a pretty easy day. The road continued to be really busy, which has been frustrating... The fumes from the trucks and buses have been particularly hard to handle, it basically feels like we are smoking a few packs of cigerettes as we are climbing our way up hills. As we were making our way up one of these hills we saw another group of touring cyclists coming the other way. We all stopped, and we made out way across the busy highway. It turns out the group of six cyclists are from Ecuador and are doing a 45 day tour around thier country to raise awareness about climate change. It was too bad we were riding in different directions, it would have been nice to ride with them. We arrived at Leonardo's house and bike shop early in the afternoon. It turned out that he had not gotten our message that we were coming, but he welcomed us in with open arms nonetheless. We had some soup with him and his four year old daughter Edeline at the restaurant next door and then went back to his home. He was incredibly hospitable, telling us that we could stay as long as we wanted, and invited us to feel at home. I thought the sign for his bike shop 'Bike House' looked vaguely familiar, and as we talked more to Leonardo we found out why. His brother has a sister shop in Toronto, on Dundas West! Torontonians may appreciate the story of how the shop in Toronto started; apparently about four years ago Leonardo's brother got a flat and went into a a bike shop to get it fixed. After about an hour of waiting he was told that it would take three days to fix the flat!!! He realized the whole bicycle repair business was booming in Toronto and decided to start his own shop, and within a couple of months Leonardo, who already had his shop in Ambato, helped to teach him about bike repairs over the web, and the Toronto shop was born! That evening Leonardo went out leaving us with a napping Edeline to look after, I was pretty excited as she is super cute kid. But after about an hour she woke up crying and kicking. Glenn and I tried everything we could think of to calm her down, and I ended up just walking around with her and singing to her for a while. Eventually I brought her into the kitchen where Glenn was cooking supper and offered her some food.... Turns out she was hungry, that's why she was crying! About half and hour later an older man came over introducing himself as Leonardo's dad, then he took Edeline saying that she was sleeping at his house. I had a mild panic attach wondering if it was Ok that we just let the little girl in our care go with an old man... Luckily Daniela, Leo's wife came home soon after and confirmed that all was well! We decided to spend one more day in Ambato to rest up a bit and make a decision about our onwards route. We had initially planned to take the mountain route (highway E35) through all of Ecuador, but had heard word of a newly paved highway through the Amazon rainforest. As we talked to more people, the consensus seemed to be that the Amazon route would be not only beautiful, but the traffic would drastically lighter. This sold me, and the chance of riding through the jungle was irresistable to Glenn. We headed off from Leonardo's house after a brief glimpse of the volcano Chimborazo. The road was a little harrowing for the first part of the day. We were on one do the main road arteries of the country, it was under construction, and we kept dipping in and much more slowly out of river valley's. Given this we were relieved to turn off the main road about half way to Banos. Leonardo had told us about a newly paved road from the town of Patate to Banos, and what an incredible road it was. It helped that it was mostly downhill, but the main beauty of it was that there was next to no traffic and it wove through lovely countryside, and then along a deep river canyon. The road was incredibly narrow and for some reason there was a yellow line separating the lanes, each of which was about the size of a bike lane... At one point a big bus did come along and I had to squeeze myself and my bike over to the edge of the road, I'm not sure what the buses plan would be for oncoming traffic that were more than one metre wide. After a long day we finally rolled into Banos, and to our astonishment the first hotel we stopped at had ground floor rooms (excellent when you are bring a bike into it) and was very cheap. Banos is a tourist town, so there are plenty of hostels and cafes catering to tourists, but people come here for good reason, the setting is beautiful and there are beautiful hot springs to boot. We decided to take another day off to make use of the springs! From here we will descend into the Amazon jungle, and we will spend about a week cruising down the amazon highway, and then we will have to climb back up into mountains!